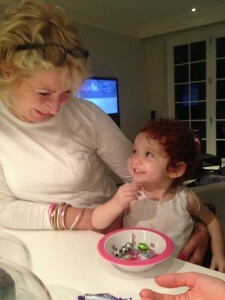 Margot with Grandma Annette last night in a jocular mood. Margot has been really very unwell over the last few days, however she continues to fight & be strong and we are pleased that she has shown some signs of improvement in the last 24 hours. It’s abundantly clear that Margot loves life and she wants to live ! The re-introduction of Dex steroids into her drug regime has helped. This is a temporary measure that is intended to help relieve the pain in Margot’s liver and spleen, both of which are now noticeably enlarged. Generally, Margot is weak, very pale and tired yet in spite of it all she has retained her sense of humour throughout. We are continuing to take each day as it comes and are doing what we can to manage her pain and to keep her comfortable, as ever being led by and inspired by Margot.